Make a bold start for your wedding day by selecting from the most gorgeous collection of foil stamped wedding invitations from 123WeddingCards. Printed on luxurious paper and designed by expert team, these stunning invitations are style statement for all the elegant and contemporary wedding ceremonies. We design these foil stamped wedding invites with passion and excellence along with real foil stamp for unbeatable glamour that surpasses the beauty of all the other designer wedding invites worldwide. The quality and printing of these ‘foil pressed wedding invites’ are done with utter care and sophistication that makes that even more appealing. At 123WeddingCards, we promise to take care of your entire wedding invitation suite and hence with these custom foil invitations, we have matching foil pressed thank you cards, save the date cards, envelopes, place cards or table cards and all the other wedding stationery. 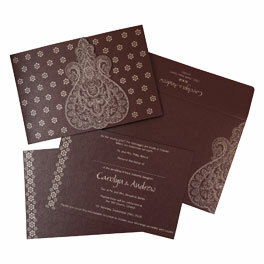 You cannot find such a remarkable collection of foil stamped wedding invitations anywhere else. Not only this, we offer you various other designer wedding invites like embossed wedding invitations that are designed according to your wedding ceremony. In short, we have something for every kind of celebration. With the help of our designers and customization tool, you can also add a personal touch to your wedding invite by selecting your wedding wordings, paper material and other detailing. We leave no scope of disappointment for our customers and hence, we offer a 24x7 customer support team that is always happy to help you. 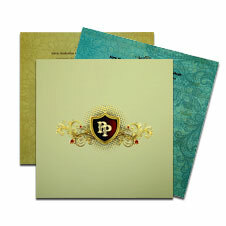 Choose from our wide range of cards and grab the best for you.